Writing about an object designed for al fresco dining could not be a better way to tempt the weather gods to bring on the return of spring. This object of the day is ‘Plack’, a picnic tray designed by Jean-Pierre Vitrac, and produced by Diam in 1977. 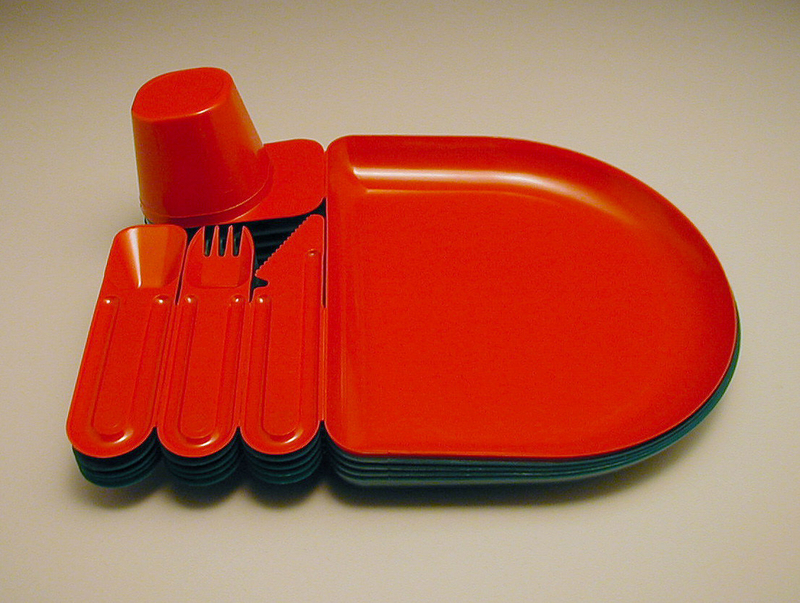 In contrast to indifferently designed plastic picnic ware available at the time, Plack was created to stand out. Ease of use, function, and bold colors were its defining characteristics. Available in monochrome hues such as green or red, Plack trays would have added a splash of intense color to any outdoor picnic table. Molded in a single sheet of polystyrene, each tray featured the necessary basics for an outdoor feast: an individual plate, fork, spoon, knife, and cup, ready to be snapped off and used. At the end of a meal, everything could simply be thrown away – no washing up required. An image published in “Throwaway Living”, a 1955 Life Magazine article, featured a couple triumphantly throwing paper items such as plates, cups, and vases in the air, highlighting a moment when throwaway household items became more commonplace, signaling a strong shift in consumer preferences. The disposable nature of Plack underlines the proliferation of this throwaway culture and how it continued to permeate American life during the 1970s and beyond. Hailed as a consumer revolution, one-use commodities held the promise of eliminating tedious domestic chores that burdened housewives, such as washing dishes. The positive attitude towards these products formed a strong part of the cultural backdrop that Plack embodies. These days, a growing sense of guilt and dread has replaced the initial feeling of optimism because we have become increasingly aware of the way disposable goods are clogging up nature’s fragile ecosystems. Thus, an artifact such as this brightly colored plastic picnic tray can harbor a darker, more worrying underside, and have the power to carry a stark message of warning surrounding the risks of throwaway culture to designers and consumers alike. Yet, at the end of the day, it still won’t hinder my looking forward to warmer, sunnier times. Zenia Malmer focuses on the intersection of food and design history. She is a volunteer in the Product Design and Decorative Arts Department. @hungry.historian. Terrific post! Not just the choice of item itself, but all the context, past and present.